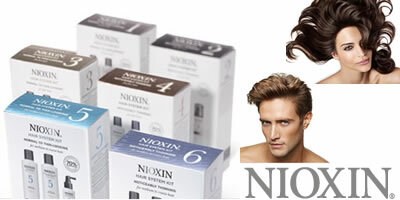 NIOXIN is the award-winning route to thicker, fuller and denser-looking hair for both men and women. Its advanced technologies include BioAMP which uses cystine amino acids to reduce hair loss through breakage and increase the fullness of each hair fibre. It was launched in 1987 by Eva Graham who began investigating thinning hair when she experienced it after giving birth. Her innovation was to treat the scalp using skincare methods and in NIOXIN she created a range in which over 70% of users notice thicker, fuller-looking hair within 30 days. A NIOXIN treatment is a 3-step process that begins with a cleansing shampoo, continues with an optimising conditioner and finishes with a thickening and refreshing hair treatment. The range is divided into 6 systems that take account of hair type, whether or not hair has been chemically treated and how noticeable thinning has become. These are supported by the Scalp Renew products aimed at boosting scalp health and the Intensive Therapy products that are designed for areas of the head where the hair has become particularly thin-looking. NIOXIN is a salon-only, professional product that allows you to offer a range of services to clients for whom thinning hair is a worry. The diversity of the range means you can tailor your services specifically to each client and, because the best effect develops over time, NIOXIN is an easy, post-service, retail sale for clients to continue their treatment at home. 5 systems available in 300-ml or 1-litre bottles. Promote fuller and thicker hair with this bestselling, proven treatment that boosts existing hair's diameter instantly. Comes in a 100-ml dispenser. Delivers deep conditioning, manageability and smoothness. Delivers an intensive boost to areas of low density hair. Comes in 30-ml or 100-ml pump bottles. A take-home treatment that restores a dense, vibrant and healthy appearance to hair. Comes in a 45-ml bottle. Leave-in restorative treatments for different types of scalps with thinning hair. Step 3 of Nioxin's 3-step system. 6 systems available in 100-ml or 200-ml bottles. Great-value kits containing all 3 parts of the NIOXIN 3-step treatment, letting you trial its effectiveness without having to invest in masses of product. Kits cover 3 systems. Each kit contains 150-ml shampoo, 150-ml conditioner, 40-ml treatment. Helps to provide hair resilience and control moisture balance. 6 systems available in 300-ml or 1-litre bottles.